Alligators in a North Carolina swamp have once again been caught on film allowing their snouts to get frozen into the water just as it dips below freezing. Last year, the alligators at the swamp park displayed the same behavior, picking up interest around the world with the rarely seen winter survival strategy that allows them to keep breathing for days in the ice. Typically found in the humid heat of the Everglades and southern states, where frozen swamps are rare, alligators might not appear to need cold weather survival skills. But the 65-acre Shallotte River Swamp park and sanctuary is near the northern edge of the alligator’s habitat in North Carolina. 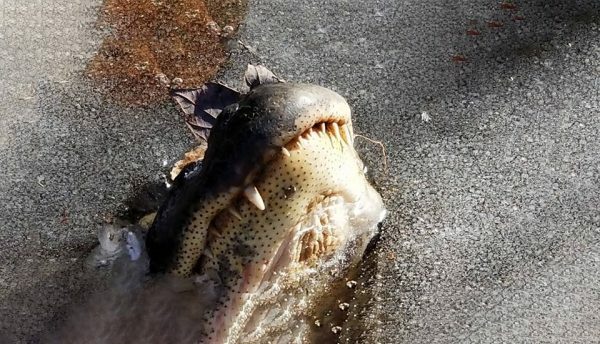 This year as the temperature dropped toward zero, even more alligators joined in, with 18 allowing their noses to get caught as the ice formed, said park Manager George Howard, who filmed the behavior. The alligators are believed to sense that the water is just turning to ice. Last year was the first time that the behavior was seen in an animal park, Howard told the Charlotte Observer. The water thawed after several days and the animals appeared to suffer no injuries or ill effects. Last year the staff found that the gators do not react when they are disturbed in their frozen state. Howard said it because they are trying to conserve energy. 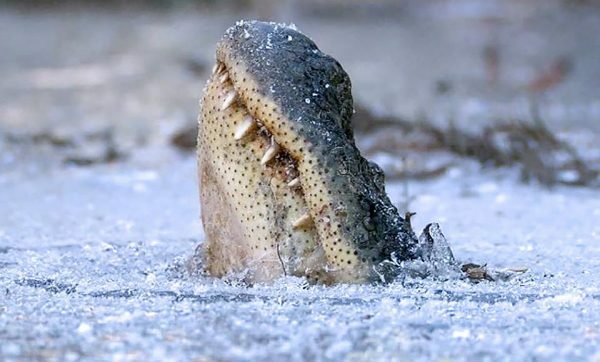 According to the Charlotte Observer, the ice-poking behavior disproves the long-standing theory that it is cold temperatures that keep alligators from spreading further north. Reptiles cope with winter by slowing down in a process called brumation. Reptiles are cold-blooded, meaning their body temperature does not need to remain at a steady higher temperature like birds and mammals. Instead, their body temperature can rise or fall with that of the environment with no ill effects—within certain limits. However, at lower temperatures, metabolism slows down, so unlike warm-blooded animals, cold-blooded animals become lethargic with dropping temperatures. Reptiles can absorb the heat of their surroundings, bumping up metabolism and activity, through certain design features. The alligator’s characteristic ridged back is precisely one of these features. The prominent bony ridges, called scutes, are full of blood vessels that pick up the heat of the sun, passing it on to the alligator’s body. 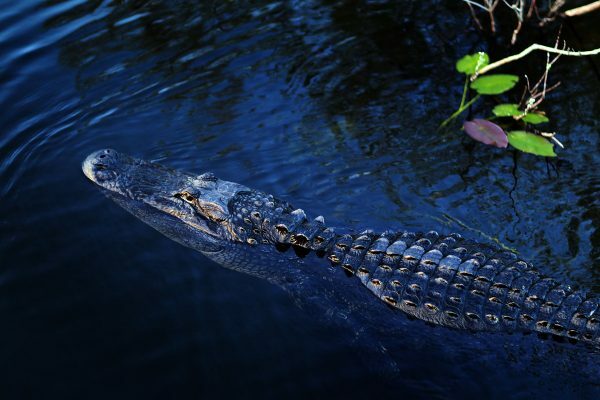 American alligators live in the freshwater rivers, lakes, swamps, and marshes of the southeastern United States, primarily Florida and Louisiana, according to National Geographic. Males average between 10 and 15 feet in length and can weigh 1,000 pounds. There are thought to be around 5 million alligators in the United States, according to Defenders of Wildlife, with 1.25 million in Florida.